Let's start with the Worst Dressed List, so our eyes can recover afterward by the Best List. 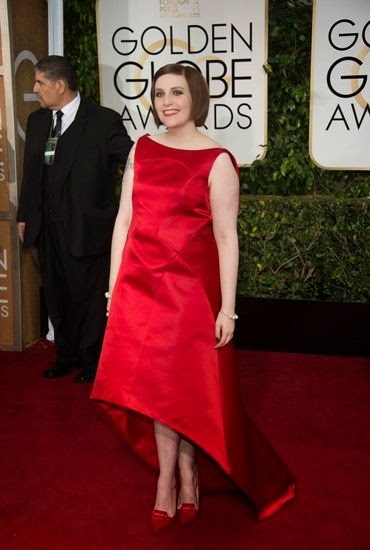 Lena Dunham – if you can believe, this is a Zac Posen. 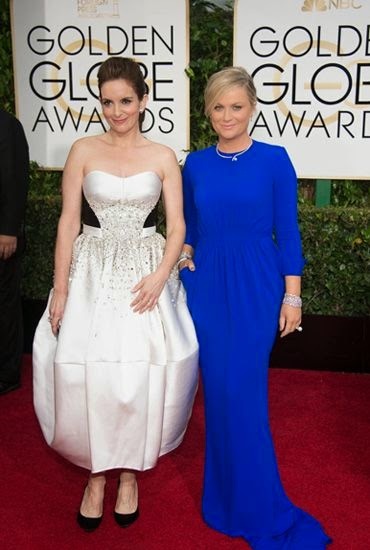 I know they're friends, but she clearly does not do him any favors wearing this gown. The dress was designed for an actual waist. One word Lena: Spanx! Or, in your case, about twice as many as Adele wore to the Grammys (which was 4). You're in Hollywood, it's a job requirement! Rosamund Pike – Vera Wang personally designed it. Question is, exactly how did it stay up? Our hosts: Tina Fey and Amy Poehler. Just like their monologue, left a lot to be desired. Helen of Troy, aka Diane Kruger – Emilia Wickstead. Classic lines, love the neckline. Emma Stone – Lanvin. Trendsetting: Vogue immediately featured pantsuits for evening affairs on the website. The Queen, aka Helen Mirren – Dolce & Gabbana. And a pin with a pen in solidarity with Charlie Hebdo. When I'm her age, I'd like my neck to look like that. Naomi Watts – Gucci and a Bulgari Serpenti necklace. Yellow and white were the big colors on the Red Carpet, this one one of my favorite. Sothebys immediately Instagrammed that they have a Serpenti coming up for auction in February. Reese Witherspoon – Calvin Klein. Once again, classic. But then it's Calvin Klein. Perfect proportions for her. And I love the bare neckline. Salma Hayek – Alexander McQueen. Salma Hayek is Salma Hayek, when did she not look good? Again, bare neckline. Emily Blunt – Michael Kors. With turquoise accessories. Another white dress done perfect. I'm sure Miranda Priesley would give a slight nod of approval. Christine Baranski – now this is how you do a Zac Posen! Mr. and Mrs. Clooney. For the record, she wore Christian Dior, the much-debated gloves where her own (as in she made them herself that morning, they're kid leather by the way), Harry Winston diamonds. Both were wearing Je Suis Charlie buttons, I would expect no less from them. I personally love the gloves, and the white clutch that went with them. You can put her in a paper bag and she will look stunning, with such intelligence shining in her eyes. George is a very lucky man. Trends of notice: statement necklaces are over, unless it is a Serpenti. Less is more. Rectangular clutch is the it bag (and it will hold your phone, finally), and if you feel like wearing pants to an event, go for it.